Military medical personnel prepare for the rigors of treating combat injuries by training at trauma centers at teaching hospitals. U.S. Army flight medic SSG Rahkeem Francis prepares to receive wounded Marines aboard his MEDEVAC helicopter September 25, 2010. In combat situations, military surgeons treat gunshot wounds, severed limbs, and maimed bodies. 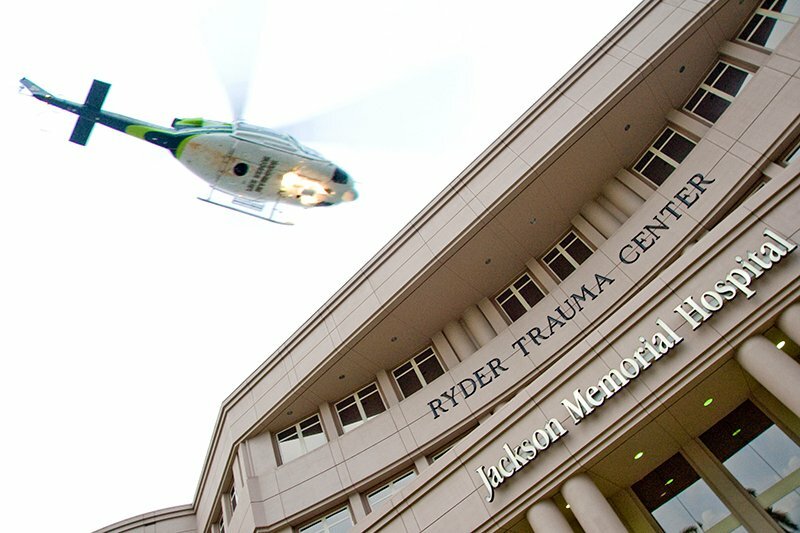 To help surgeons and other care providers better prepare to handle such traumatic injuries, the U.S. Armed Forces often send their medical personnel to trauma centers at teaching hospitals, where they are more likely to see severe wounds from gunshots, stabbings, and vehicle wrecks than in stateside military hospitals. And personnel returning from overseas deployment sometimes retrain in a teaching hospital to keep their skills sharp. “In garrison, whether it’s at Walter Reed or Fort Campbell or whatever hospital they’re stationed at, they’re not doing trauma,” says George Garcia, MD, a retired Army surgeon and now attending trauma surgeon at Ryder Trauma Center at the University of Miami. The center provides the opportunity “to get back in the groove of taking care of severely injured patients,” Garcia explains. Military and civilian joint training efforts date back to the 1990–1991 Gulf War and run the gamut. For example, the Air Force C-STARS (Center for Sustainment of Trauma and Readiness Skills) program rotates whole trauma teams through two-week stints at civilian trauma centers like those at the University of Maryland Medical Center, Saint Louis University Hospital, and the University of Cincinnati Medical Center. Other collaborations provide longer rotations to individual surgeons, nurses, medics, and other staff members. The advantages of such trainings for military personnel are clear. A 2016 study in Military Medicine, for example, reported that military surgeons embedded in a civilian trauma center treated nearly six times more cases than surgeons in a nearby military facility. Moreover, the military orthopedic trauma surgeon working at the civilian center performed 242 cases that met an Air Force combat readiness skills checklist. The average at the military hospital was 12. Garcia highlights some of the trainings’ benefits: “I think it’s important for them to do that [work] in a ‘safer’ environment where they have someone watching over and reminding them of things before they’re out there on their own with really no backup,” he notes. Academic medicine institutions and the U.S. Department of Veterans Affairs have collaborated extensively for more than 70 years. Following World War II, millions of men and women returned home needing care for injuries and illnesses, and many physicians came back requiring additional residency training. To address these challenges, the VA and academic medical centers established a unique partnership. Today, 127 VA facilities have affiliation agreements with more than 130 U.S. medical schools for physician training. The VA partners with medical schools and teaching hospitals on numerous efforts, including shared education, health care, and research projects. Many medical school faculty members also teach at and provide care at VA centers, and more than 70% of U.S. physicians have received training in the VA health care system. Now retired from active military service and serving as a civilian professor at USUHS, Bowyer works part time at MedStar Washington. There, he and other experts train about 15 to 20 military doctors each year. Military members typically spend a month on the MedStar surgical team where they participate in the full academic curriculum that civilian trainees receive, including lectures and conferences, explains Jack Sava, MD, FACS, MedStar Washington’s chief of trauma. Col. Rachel Hight, a squadron commander at David Grant USAF Medical Center at Travis Air Force Base, Calif., points to another lesson trainees learn at trauma hospitals. “Part of [the education] is just getting used to taking care of multiple casualties and getting that sense of where priorities need to be,” says Hight, who helped create an Air Force trauma education program with the University of California (UC) Davis Medical Center in 2009. In addition to integrating military surgeons into civilian trauma training, the program rotates support personnel into civilian trauma care for varying periods throughout their three- or four-year USAF duty assignments. Garcia spent the beginning of 2008 on a forward surgical team in the mountains of Afghanistan, treating victims of intertribal violence, landmine explosions, rocket attacks, and more. When he returned stateside, Garcia began teaching military surgeons at the University of Miami Ryder Trauma Center. Roughly 25% of the 3,500 patients that come through Ryder each year have penetrating injuries, such as gunshot and stab wounds, Garcia says. Twenty-person military surgical teams from around the country train at Ryder for two weeks before they deploy. They typically include surgeons, nurse anesthetists, operating room technicians, ICU and recovery room nurses, and medics. An important goal is allowing the entire team to practice together in a clinical setting, which they don’t typically get to do in stateside military hospitals, says Garcia. Garcia and others note that it's not just the military that benefits from the civilian-military partnerships. Civilian trauma centers gain much from the relationships as well. “They benefit from some of the things we’ve learned at the battlefield that we can bring back to the bedside,” says Hight. For example, when she was stationed in Afghanistan, military medics often used tourniquets to control severe bleeding, but they were rarely used in civilian settings despite their effectiveness. UC Davis implemented wider use of tourniquets in its trauma bay and helped get surrounding emergency medical service teams to use them too. It's also helpful to have trained military surgeons sharing the workload, especially at night when many patients are admitted, Sava notes. Finally, says Garcia, civilian centers have the opportunity to contribute to a national mission. “What my partners who have not had a military experience get out of it—I hope—is the satisfaction of preparing these guys and gals to go overseas and do some really important work. Their patients are, in my mind, the nation’s most valuable resource,” he says.